Maurice used his Fae magic to help the downtrodden and abused. But when he went too far, the Powers-That-Be decided he needed to learn humility, self-restraint, and mercy. They took away most of his magic, shrunk him down to 5 inches, and slapped wings on his back that no self-respecting Fae would be caught dead in. Then they exiled him to the Human realms, to work out his sentence helping Humans. 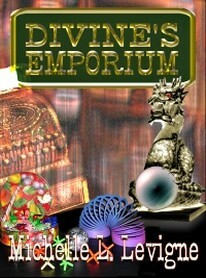 His destination: Divine's Emporium, a curiosity shop touched with magic, on the edge of the odd town of Neighborlee, Ohio. His parole officer: Angela, the proprietress of Divine's Emporium, touched with magic and a shadowy past of her own. His sentence: Help the Humans who come into Divine's to find answers, freedom, their own magic, and true love. Not necessarily in that order. His problem: How does a five-inch-tall Fae, invisible to most Humans, win the heart of the ugly duckling who has caught his interest, his sympathy, and then his heart--when she can't see or hear him? Maurice - the exiled, shrunken Fae with wings even Tinkerbell would scorn--has one wish: to be real for Holly, the librarian. In her dreams, they are in love, but she doesn't remember or see or hear him when she's awake. He is only allowed is one day, four times a year, to be full-sized, able to talk with her and try to win her heart. Christmas is coming, and his next day as an ordinary man. As he waits impatiently for his rendezvous with Holly, life goes on in Neighborlee, Ohio. Albeit, life in Neighborlee isn't what most people would call normal. Especially when three couples come to town with various magical dilemmas to resolve. Bethany is a local girl who became a Hollywood starlet. All she wants is an ordinary Christmas, sans paparazzi. With the help of Harry and his malfunctioning invisibility spell, she just might get it. And a lot more. Wilfred and Philomena are best buddies, and their Fae relatives want them separated so each one can find their true love. But what happens when your true love is under your nose, and you can't convince him – or her – of that important little fact? 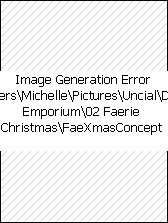 Lori is allergic to mistletoe, and on the run from her aristocratic relatives who want to pair her with an "appropriate" Fae man. She hides out in Neighborlee and meets Brick, who has some romantic interference problems of his own. He believes in magic – but can he believe in Fae or think she's insane when she tells him the truth? Christmas is the most magical time of the year – especially for Fae in search of love in Neighborlee, Ohio. Equinox: Maurice has a day of full-size freedom to spend with his true love, Holly. 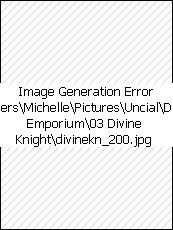 Their day of fun ends in panic, when Angela is attacked and the defenses of Divine's Emporium are breached. In the search to find out who hired thieves to steal books full of inimical magic from the shop and provided them with magic charms to do it, Angela's memories are stirred. Strange dreams disturb her sleep and she asks questions she hasn't thought of in decades. Ethan Jarrod, a particularly gifted P.I. with some mysteries of his own, joins forces with local P.I. John Stanzer to identify Angela's enemies. Is Jarrod the knight from her dreams, or the final weapon of her enemies, to destroy all the magic of Divine's Emporium and Angela herself?